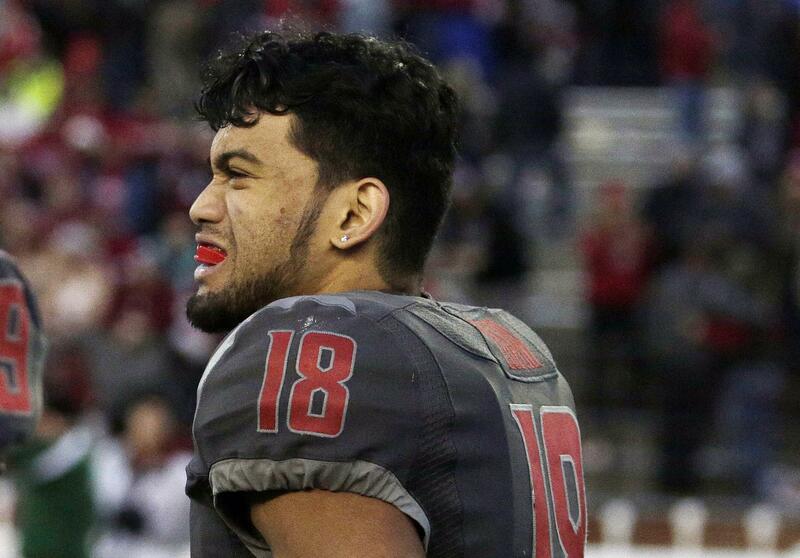 COLFAX – Whitman County Prosecutor Denis Tracy said Wednesday he expects to decide by Monday whether to charge Washington State football player Shalom Luani with felony assault. Tracy received the results of a Pullman Police investigation last Friday centering on Luani’s Aug. 24 arrest following a fight outside a Domino’s Pizza that left one man with a broken nose and Luani with a concussion. Tracy also is awaiting investigations relating to the three other WSU football players, including the Sept. 12 arrest of Logan Tago and the Sept. 16 arrests of Robert Barber and T.J. Fehoko. Tago is suspected of assault and robbery stemming from a June 4 incident in which a man claimed that Tago punched him and stole a case of beer he was carrying. Barber and Fehoko were arrested in connection to a brawl at a June 23 house party in which one man suffered a concussion and another had his jaw broken. Charges also will be requested against WSU students Pedro Diaz and Dylan Rollins, both 19, for their alleged roles in provoking fights at the party. Tracy said his decision on whether to file criminal charges may be delayed if he needs Pullman Police to do further investigation or if the case requires further legal research. If Tracy pursues felony charges, the cases would typically take about four months to resolve, he said. “The football season and the fact that it’s a football player charged doesn’t factor into the time I take to resolve a case,” he said. Athletics director Bill Moos told The Spokesman-Review last week that coach Mike Leach suspended Luani for the first game because of what appeared to be his rude behavior that started the fight on Aug. 24. However, Luani played in the loss at Boise State and in last Saturday’s win against Idaho. Moos said – and the Washington State Code of Conduct states – that a player cannot participate if he or she is formally charged with a felony. That is the review that Tracy said he expects to have completed by Monday. Washington State does not play again until hosting Oregon on Oct. 1. Published: Sept. 21, 2016, 1:36 p.m.